How does sport change lives? 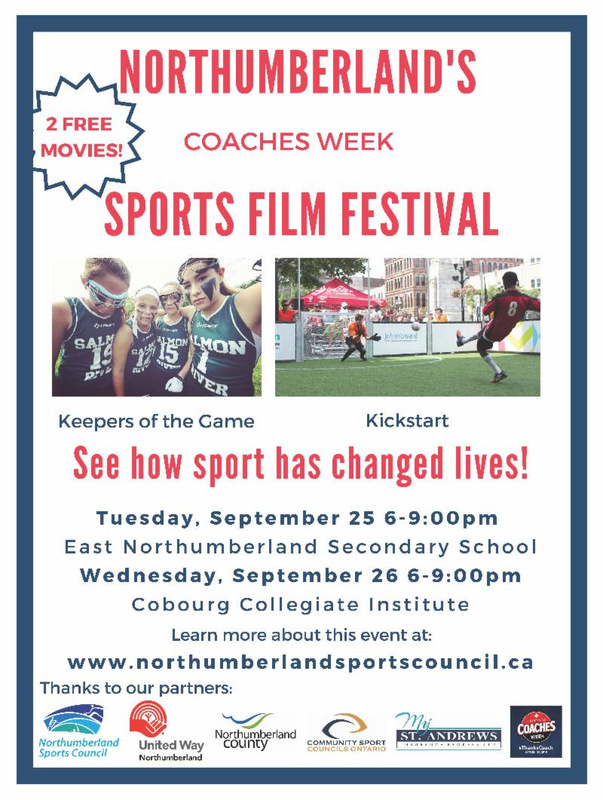 Please join Northumberland Sports Council and its partners for an exclusive screening of 2 Canadian Sport Film Festival documentaries to find out! Both documentaries will be featured on September 25, 2018 at East Northumberland Secondary School in Brighton AND on September 26,2018 at Cobourg Collegiate Institute from 6:00pm-­-9:00pm. We are pleased to be able to offer these movies for FREE to the community. The goal of this project is to highlight some of the social determinatesofhealthexperiencedacrossNorthumberlandcountyandexplorethedifferentwayssport and physical activity can provide a place of belonging for all. The first movie is Keepers of the Games. This film showcases Lacrosse. Lacrosse was born in Akwesasne Mohawk Territory as a sacred game, traditionally reserved for men. Just off the reservation at Salmon River High in Fort Covington, NY an all-­-Native girls lacrosse team comes together, seeking to be the first Native women's team to bring home a Section Championship. But first, they will have to overcome their crosstown rivals, Massena High. As the season comes to a head, the team is faced with increasing ambivalence in their own community and the girls must prove that the game of lacrosse is their rightful inheritance. With more than just the championship on the line, the girls fight to blaze a new path for the next generation of Native women, while still honoring their people's tradition in a changing world. The second movie is called Kickstart. On September 12th, the Homeless World Cup will kick off in Amsterdam. Bringing together participants from 70 countries, the annual event puts a spotlight on global issues of poverty and homelessness. Street Soccer Canada,a non-­-profit that runs a network of over 20 soccer programs at shelters in a dozen cities across the country, has sent a team to the tournamenteachyearsince2004.Fortheshelteredandhomelessindividualswhoplay,it's a chance to be part of a team. And sometimes that small step is all it takes to get the ball rolling.